We are delighted to bring you the latest issue of T & L Reading, our new collaborative newsletter of Teaching & Learning policy and practice, with key articles, news, and headlines from around the University of Reading – digital and otherwise. I haven’t featured it on this blog before, but this term’s edition is particularly rich in digital news, with the new E-Learning Support tab on our Blackboard VLE and forthcoming Blackboard upgrade making the headlines, a summary of what the new TEL Strategy Group is all about on page 3, and another chance to find out more about Matthew Nicholls’ Digital Silchester module. 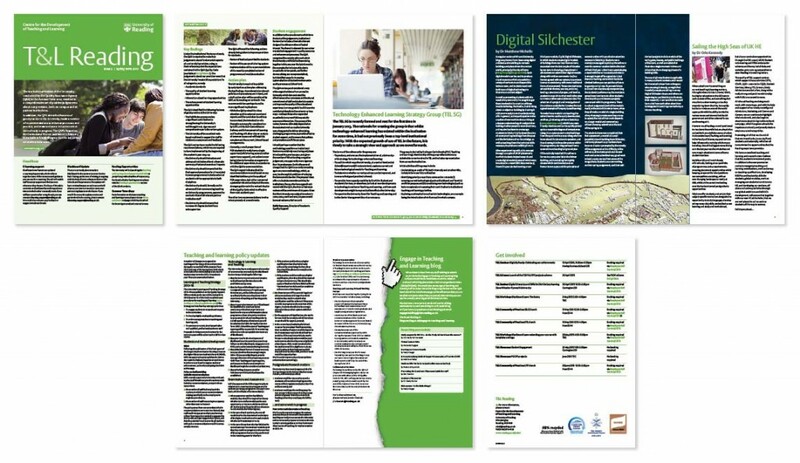 In terms of policy development, the University has recently approved a number of recommendations made by the Blackboard Review Group, which are recounted in the newsletter – basically a reaffirmation of the University’s commitment to developing Blackboard as the main platform for TEL provision. The new University Learning & Teaching Strategy 2013–2018 gets a mention too, and although you have to read the fuller version posted on the University website to realise it, this is actually a bit of a landmark in digital development at Reading: technology-enhanced learning is referred to explicitly, for the first time ever, as one of the areas which Reading is committed to developing. If you haven’t come across T & L Reading before, it’s well worth looking out for – issued (mainly) in PDF format, the newsletter comes out three times a year, on a termly basis. Designed to complement the University’s Engage in Teaching and Learning blog, it provides an excellent overview of Teaching & Learning news. You can download the Spring issue here by clicking on the image above. This entry was posted in Dissemination and tagged Blackboard (VLE), Blackboard Review Group, Engage in Teaching and Learning blog, Learning & Teaching Strategy 2013-2018, Nadja Guggi, T & L Reading, TEL Strategy Group. Bookmark the permalink. This is really good news for teaching development at RU. There are so many digital tools available now that it’s hard to believe how much we missed out on before the internet, the web and a vast array of technologies that can access remote information from almost anywhere. As a student I spent hours going through journal contents pages hoping to find papers I wanted. I now expect most of the information to be available from my desk immediately, or at least after a few hours. Technology has reduced the time taken to retrieve information, we now need the time to read and process that information – or tools to do that for us.